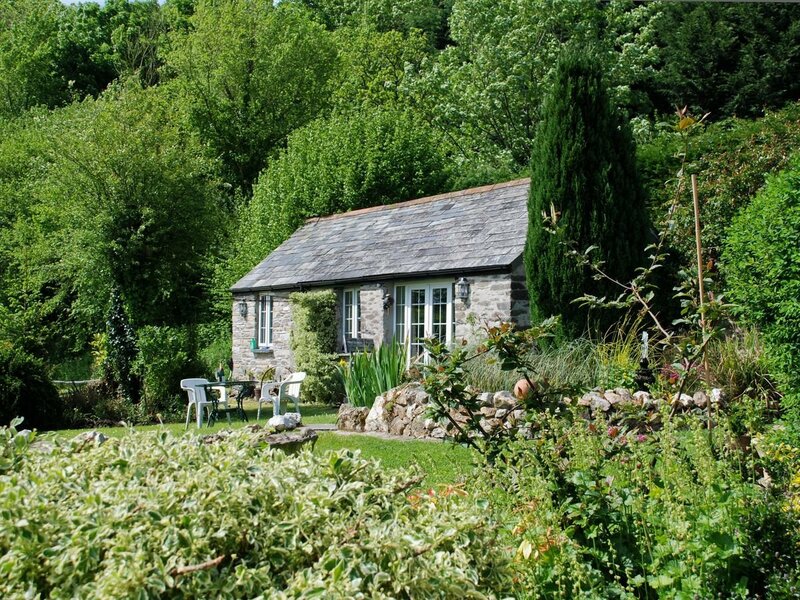 Pixie Cottage, a single-storey, delightful holiday retreat in stunning gardens on the banks of the River Tamar, one of the most beautiful rivers in Britain forming the boundary between Cornwall and Devon. This cosy detached holiday cottage sits within the owner’s 3-acre garden, where guests are free to explore and take a stroll down to the river bank. The stunning North and South Devon and Cornwall Coasts are within 40 minutes’ drive, and is steeped in history and legend, discover the fascinating coastline. There is a large play barn/summerhouse for guests to use with darts, a pool table and air hockey. Fishing, golf and riding are available locally, whilst walkers and cyclists will be spoilt for choice with the routes on offer. Shops 2 miles, pub and restaurant 3 miles. Ground floor studio: Living/dining room/kitchen with double bed, patio doors and beams. Shower room with toilet. Oil heater and elec inc (£15pw Nov-Mar). Bed linen and towels inc. T/cot. DVD and small library. Elec cooker. M/wave. Shared lawned garden and furniture. Shared grounds. Gas BBQ. Parking (2 cars). Pool table, air hockey and darts. No smoking. NB: There is a pond in the garden and river at the end of the 2-acre grounds. Be the first one to tell us about your rental experience while staying at Pixie Cottage. Let us know if the listing matched your expectations. You can share your comments about the location, property owner/manager and all the unique features that made your stay a memorable one.